Dreaming of the day you come home from an exhausting nine-hour work day to be greeted by a happy, healthy, well-exercised four-legged mister of missus? Then you have come to the right place! We don’t just want to be your dog’s walker. We want to be your buddy’s second-best friend, so our dog walking service begins with a free in-home consultation where we learn more about you and your pooch’s needs and come up with the best fit. All of our canine clients receive personal, one-on-one attention with 20-, 40- or 60-minute walks that cater to their individual needs, whether they prefer distance walks or an opportunity to sniff around and explore. We provide daily pup reports so that you’re always aware of how your dog is doing while you’re away. Pawz focuses on having fun while practicing good leash and social skills, and your dog’s safety and happiness comes above all. Our goal is to establish a consistent, long-lasting and healthy relationship between our dog walkers and your four-legged loved ones, so we offer discounts to regular clients. Every walker uses a GPS tracking app that sends an overview of each walk to your phone and email. In order to provide you with exceptional service outside of our normal business hours, we charge 30% more for walks before 9 am or after 5 pm M-F, on weekends and on major holidays as well as bookings made on the day of the walk. For walks outside of our service area, we charge 20% more. Another pooch in the household? 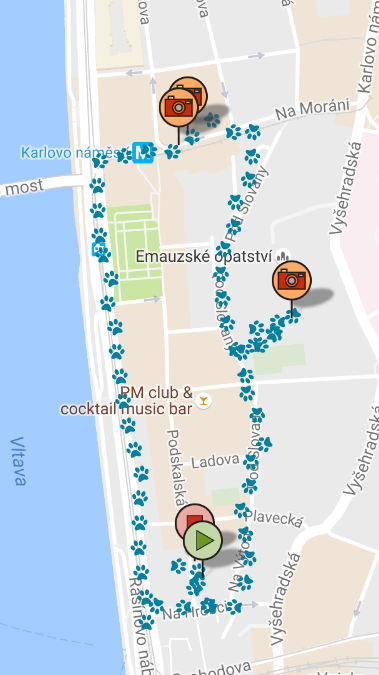 Please add 100 CZK for each dog.